Garrett GT3582R Bolt-on Stock Location Turbocharger Kit. Subaru Forester XT/2.5XT, Legacy GT/2.5GT, Outback XT/2.5XT, WRX, STI. It's a lot of work, but ATP has done it! This ATP Turbocharger Kit features the Garrett GT Ball Bearing GT35R (aka GT3582R aka GT35/40R). The GT35R is the ultimate 600+ HP capable dual ball bearing turbo and is now available in a drop-in package for the Subaru WRX/STI! The easy to implement turbo assembly that takes no more than 1-2 hours to install in place of the stock journal bearing VFXX unit is made possible by a high flowing GT inspired ATP exhaust housing and a series of custom engineered components built to suit the installation. Each GT drop-in turbo package consists of a Garrett factory assembled and high speed balanced dual ball bearing CHRA which is then assembled into a set of CNC machine ported housings that have been optimized in every aspect for maximum flow and efficiency. All accompanying oil and coolant supply components included in each kit have been designed to properly and seamlessly bridge the Garrett GT turbo to the EJ engine so that the fit is as OE as possible. Just bolt the turbo on, add fueling and a good tune and prepare for a blast of acceleration. Garrett GT turbos offer more then just "peak HP" numbers. These GT turbos off more torque area under the curve and more "accessible" power then any other turbos series out there. We do recommend that you compliment your GT bolt-on turbo with a nice high flowing bellmouth downpipe and a high flowing inlet pipe to effortless channel air in and out of the turbo. Although every bolt-on GT turbo ships with a 3" inlet, we do provide a "stepdown" sleeve just in case you're forced to use the stock 2.25" inlet hose. However, as a rule of thumb, turbos, especially higher flowing units love as much inlet flow as possible. This promotes both quicker spoolup and better ultimate HP, with less boost pressure at the manifold. The 3 downpipe and bigger inlet is critical for reaching peak efficiency on the GT turbo. Please also be aware that some downpipes such as the stock catted downpipe, has a "no-flow" door at the wastegate flapper area. This type of downpipe may not allow the wider swinging wastegate valve to open all the way, thus causing the possibility of a "boost-creep" condition or uncontrollable rise in boost. The GT3582R is a great power maker on the 2.5L that still has great spoolup, especially if you're looking for best area under the curve possible, but still need a lot of power in the high revs. The GT3582R makes boost about 200 to 300 rpms later than the GT3076R but keeps pumping where the GT3076R starts to run out after 500HP. A lot of the boost is still available at part to medium throttle. Dual ball bearings means some boost is always there even if you are lugging the engine and boost recovery between gearshifts is awesome with full boost ready even before upshift is complete as the STI lurches forward with shear enthusiasm at the onse of each gear. The 2.0L driver should not rule out the use of the GT3582R if his HP target is in the same range. This competition grade turbo is still a big favorite for the HP range because it hits like a hammer while other 600HP turbos are still "spooling up". Just like the GT35R kit ATP-SUB-005 but with built in flange for Tial 44mm wastegate on the turbine housing. High flow, less exhaust backpressure, more precise boost control, even more power! 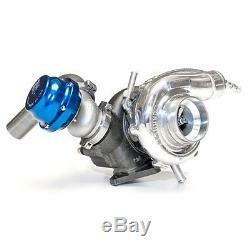 Tial 44mm wastegate and dump tube included with this listing. Dual Ball-Bearing Turbocharger for the best spool time - You can still hear the wheel spinning after you shut off the motor. Flanged for 44mm External Wastegate (Wastegate Included with Dump Tube). ATP Prioprietary Turbo Exhaust Housing with integrated external wastegate flange. Capable of 600 horsepower or more. Direct bolt-on installation to factory turbocharger location. Includes all lines and fittings necessary to complete installation. Please feel free to check out my. The item "ATP STOCK LOCATION BOLT-ON GT3582R TURBO KIT FOR SUBARU 02-14 WRX/04-16 STI+EWG" is in sale since Wednesday, March 2, 2016. This item is in the category "eBay Motors\Parts & Accessories\Car & Truck Parts\Turbos, Nitrous, Superchargers\Turbo Chargers & Parts".